All good things must come to an end, including summer's annual sweat-soaked spirits fest in New Orleans, Tales of the Cocktail. There were new releases, old favorites, and exclusive sneak peeks galore. Here's but a small glimpse behind the curtains at what was being poured up and knocked back all week long. Plantation Rum debuted their newest sensation to-be in a tasting room event at the Hotel Monteleone, Plantation O.F.T.D. The overproof, funky beast of a rum is bottled at 69% ABV, and incorporates rums from Jamaica, Guyana and Barbados. While the bottle's label will tell you that the O.F.T.D. designation stands for Old Fashioned Traditional Dark, the acronym is actually a stand in for Oh f*** that's delicious, which one David Wondrich apparently proclaimed while tasting through the sample blend eventually chosen to be used by the brand. The project actually got kick started last summer at Tales, and culminated with a trip to France with Plantation's Alexandre Gabriel, and along with Wondrich, also included a rum tiki super-team of Jeff "Beachbum" Berry,Martin Cate, Paul McGee, Paul McFadyen, and Scotty Schuder. The Plantation folks certainly had a good week at Tales, too. In addition to the debut of O.F.T.D, their Pineapple Stiggins' Fancy Rum went on to be named the Best New Product at the Spirited Awards. Fords Gin Martinis & oysters at Seaworthy, Ace Hotel. Photo by Jake Emen. There was plenty of rum to be found elsewhere across Tales, of course, and not just at Beachbum Berry's Latitude 29, a near-mandatory bar visit for any in-town reveler. One worthy stop was the Diplomático Duo event at the Ace Hotel, where a full pig roast, a Latin jazz trio, cigar pairings and plenty of Diplomático offered a full Venezuela Experience. Cocktails included the Get Up & Go, with Diplomático Reserva, Stumptown cold brew, lemon juice, orgeat, and mint; the Morrocoy Cooler, with Diplomático Exclusiva and Blanco, curaçao, a fruit smorgasbord of pineapple, passion fruit, pomegranate and lemon, as well as orgeat syrup, soda and garnishes galore; and the Tucacas Cobbler, with Diplomático, Amontillado sherry, Amaro Lucano, orange, raspberry, blackberry, mint, and gum arabic. Beyond those intensive libations, pours of Diplomático's Ambassador Selection and premium single vintage expressions could also be found. While Diplomático struck first in the pig roast department, Sunday also offered the 7th annual Pig n Punchcharity event from The Bon Vivants, with signature t-shirts and other memorabilia available for sale, and all proceeds going to KIPP New Orleans Schools. Over a dozen combined teams offered bites and punch for the masses as revelers sweated out a week's worth of toxins on a blazing, swampy New Orleans afternoon. Back to the Ace though, the neighboring Seaworthy restaurant served as the site for a Fords Gin festival of Martinis and oysters. Three unique Martinis were paired with three oysters, one from each U.S. coastline. Each Martini offered a base of Fords Gin, of course, but otherwise highlighted unique ingredients -- the East Coast Martini showcased Manzanilla sherry; the West Coast Martini featured Lillet Blanc and Muscadet wine; and the Gulf Coast Martini was made with a Guinness syrup and Cocchi Americano, garnished with a radish slice. Jumping ship to the Ritz-Carlton hotel, Hennessy was in town for a special look at an upcoming release due out this fall. Known as Master Blender's Selection, the limited edition expression incorporates eaux-de-vie between five and 15 years, and is bottled at 43%. It's a one-time, U.S.-only release that will retail for $80 for a full 750ml bottle. Pisco Portón, photo by Jake Emen. Orleans teamed up with Pisco Portón and distiller Johnny Schuler, while other bartenders included Charlie Moore, Jim Kearns, Brother Cleve, Alba Huerta, and Roberto Melendez, from Lima. ribs in the booze. The brand made a single still's worth at the end of the distillation season, more as a fun celebration than anything else. Yet, two years into the tradition and now they may actually try to bring the product to market next year in the U.S., after a trial run in France this year. 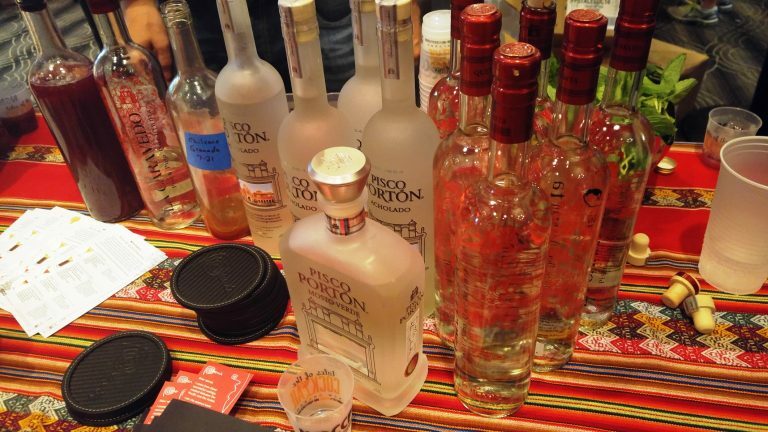 The event also offered a look at a newer to the U.S. entrant, Cuatro G's pisco. The brand debuted in the U.S. at the end of last summer, and is available now in several markets. They offer a handful of different expressions with more said to be on the way. Dramatic "Dark Art" cocktail at the Maker's Mark dinner, photo by Madeline Rose. Maker's that matches their heart's desires. With ten staves to fill and five options for each, the mathematicians have told me there are over 1,000 potential combinations. 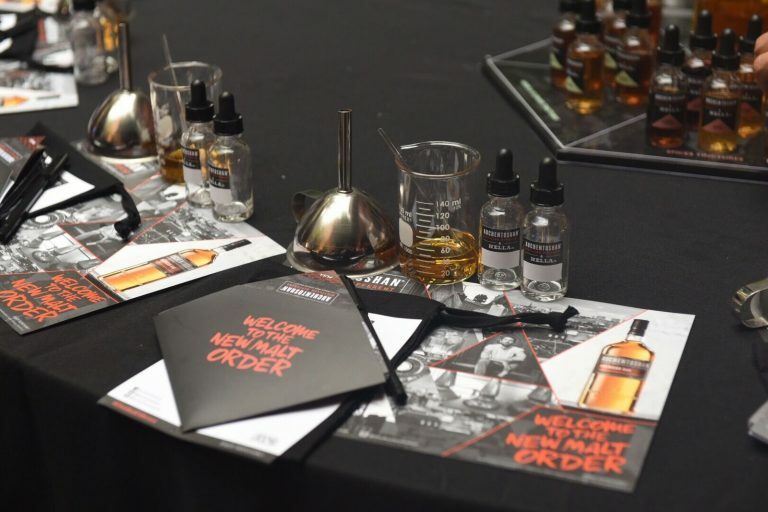 Maker's COO Rob Samuels was in attendance and led a tasting highlighting those different stave finishes, while courses of dinner and drinks were conceptualized to highlight varying components of the whisky, such as char and smoke. The first completed Private Select offerings hit shelves and restaurants at select markets this spring, but expect the brand to be rolling this out more heavily in the months and years ahead. 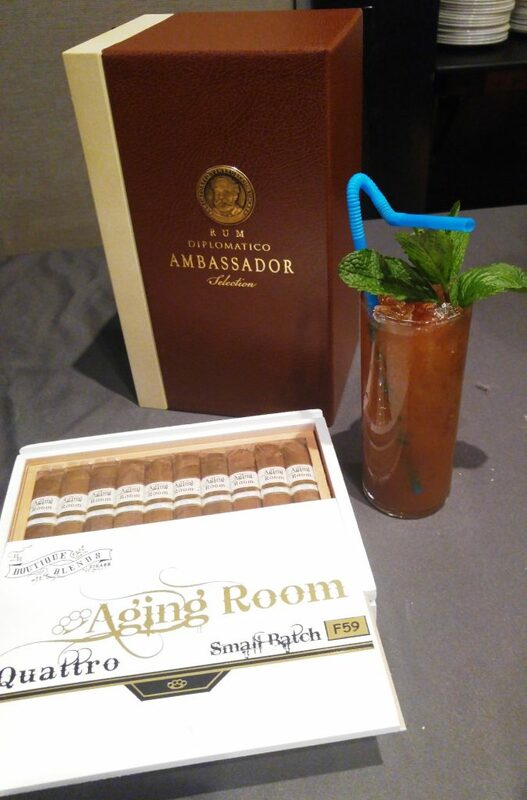 ]A visit to the Beam Suntory Hotel at Arnaud's offered classic cocktails and bites, and showcased some special whiskies from their portfolio. A seeming country by country tasting journey was offered, with stops including Scotland, Canada, Ireland, and beyond. Way back in the room, as if to deter those who weren't dedicated to finding it, was the Japanese table. There, the new Suntory Toki blend was available, but attention rightfully turned to the Yamazaki 18 and Hibiki 21 being served up. Elsewhere, apparently the Courvoisier L'Essence and Canadian Club 30 year were both kicked before this particular writer found them, while other noteworthy pours from the Beam Suntory empire included the likes of Kilbeggan 21 year, Booker's Rye, and Knob Creek 2001 (the latter two poured by distiller Fred Noe himself). Auchentoshan had their Blood Oak expression, aged partially in red wine casks, available for sampling at the Beam Suntory Hotel as well. But the triple distilled Scotch stalwarts were just getting started, as the next day they teamed up with Hella Bitters for a DIY bitters session at the New Orleans Pharmacy Museum. Auchentoshan brand ambassador Robin Nance and Tobin Ludwig from Hella hosted the event, using the flavor profile of Auchentoshan's American Oak as a starting point to formulate a unique range of matching bitters. Participants created their own concoctions from handfuls of different herbal and floral components, spices, fruits, along with varying bittering agents. crystal bottles and decanters. They also shepherded guests around the city all week via Bentleys and Maseratis with their Rare Rides program, with more Rare Cask flowing along the way as the glitzy vehicles meandered through crawling French Quarter traffic. Just as whisky had my attention first and foremost all week long, so too did it offer the ultimate highlight of my personal Tales of the Cocktail journey -- the Diageo Special Releases Spirited Dinner, held at Commander's Palace on Thursday night. Cocktails were provided by Ryan Chetiyawardana (a.k.a. Mr. Lyan), and the event was hosted in part by a pair of Diageo all star Morgans, Dr. Nick Morgan, head of whisky outreach at Diageo, as well as Ewan Morgan, national director of Diageo Masters of Whisky, no relation, and who was to go on to be crowned the MMA2 champion the next day at a raucous and engaging seminar. Proceedings here were decidedly more low key, albeit with bits of humor interspersed as each whisky was introduced with a short speech, by the likes of the tag-team Morgans, as well as Dave Broom. Commander's Palace delivered exceptional food, service and ambience, but the stars of the show were of course what were being poured, an immersive, exclusive peak at some of the most prestigious current releases amidst the Diageo scotch portfolio. Folks, we're talking Port Ellen 32 year, the 15th release, Brora 37 year, from 1977, the Cally 40 year, Dailuaine 34, not to mention Clynelish Select Reserve and 14, Talisker 10, and both Lagavulin 8 and 16. Special releases doesn't begin to do the collection justice, and the lineup would have made the entire week a worthwhile endeavor, before even getting to all of the aforementioned drams and diversions. Until next year, Tales of the Cocktail!